Because changing the fruit on top just wasn't enough. I’ve totally been slacking on the Daring Bakers front lately. It’s partially my schedule and partially a lack of inspiration – as much as I would’ve liked to have participated last month, I make a big batch of tiramisu every Saturday night at work and just wasn’t feeling the love for that particular dessert when it came down to it. But orange tian? I’d never even heard of it before! So much prettier than oranges, don't you think? 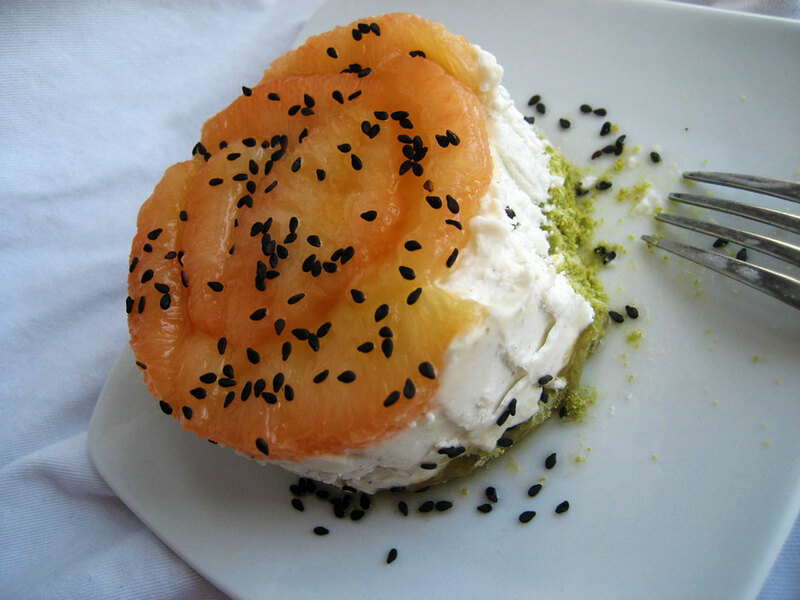 Since we were given the ok to change the fruit and flavor the cream and sablee however we liked, I went for an Asian twist and used gorgeous two-toned grapefruit with black sesame whipped cream and matcha sablee. I was excited to finally have an excuse to buy some black sesame paste and very happy to bake something with matcha again. Flavorings aside, I changed up the recipe quite a bit. The marmalade in the original recipe calls for pectin and I personally feel that putting extra pectin in marmalade is a little silly. Citrus gels up quite fine on its own. I also had to use a different base recipe for it, though, since I was using grapefruit and no matter how long you cook it, the tough membranes between segments are no fun to eat. I also had to look up how to do the stabilized whipped cream with powdered gelatin, since that’s all I can really afford to use at home. Bitter, sweet and oh so good! I really like how this dessert came out. The marmalade is shockingly sweet but provides a great balance between the bitter matcha and nutty sesame cream, which isn’t really sweet at all. The grapefruit on top is predictably tart but the caramel sauce adds another nice dimension of sweetness. Overall the dessert is not very sweet, beautiful to look at and quite fun to put together. And the endless possibilities for matching citrus with cream and cookie flavors are an extra sweet bonus. Combine the flour, matcha, salt and baking powder in the bowl of a stand mixer. Add the butter and mix until incorporated (it will look sandy). Whisk together the sugar, egg and water, gradually add until incorporated. The dough will still be quite crumbly but should clump together if you squeeze it in your hand. If it’s not clumping, slowly add a little more water but not until it’s a wet or even cohesive dough. Wrap tightly in plastic and chill at least 30 minutes or overnight. When ready to bake, preheat the oven to 350F and roll the dough to 1/4″ thick. Cut out circles in desired sizes and bake on a lined cookie sheet for 15-20 minutes, rotating halfway through. Don’t let the edges take on much, if any, color, but make sure that the undersides are fully baked. Cool fully before attempting to assemble tians. Any leftover dough can be rolled into a log, brushed with water, rolled in sugar and sliced into cookies of desired size and thickness. Segment (supreme) the fruits, reserving the peels. Set the segments aside and chop the peel into very small pieces. Place in a saucepan and cover with water. Bring to a boil, then simmer until the grapefruit peel is translucent and orange all the way through. Let the blanched peel cool overnight, covered, in the water. Drain the cooled blanched peels, reserving the water. Add enough water to measure 1 cup and combine in a saucepan with the peels, segmented fruit and sugar. Bring to a low boil and cook, stirring occasionally, until reduced by half. Transfer to a heat-proof container and chill. Segment the grapefruits, place segments into a heat-proof container and set aside while you make the caramel sauce. Place the sugar in a saucepan and heat until it begins to foam and caramelize. Gradually pour in the grapefruit juice. Once it’s all in, cook over medium heat until any crystals have melted. While hot, pour half of the sauce over the segmented grapefruits. Reserve the other half for plating. Place the cold water in a medium mixing bowl and add the gelatin. In a stand mixer, start whipping the cream with the sugar on medium speed. Once the gelatin is saturated, place it over a simmering double boiler and melt into a liquid. Pour into the center of the whipping cream (it should be thick but not forming peaks at this stage), then add the sesame paste and whip to medium peaks. Wrap one end of the ring mold tightly in plastic, forming a drum-like seal. Invert and arrange the segments on the plastic. Fill the molds with whipped cream to 1/4″ of the top of the mold. Spread marmalade on the sablee discs and invert them into the molds. Freeze immediately for at least 10 minutes before unmolding. Anna this is beautiful! I really enjoy your perspective. The colors are so pretty. I made grapefruit marmalade too but I’ve not tried it yet. 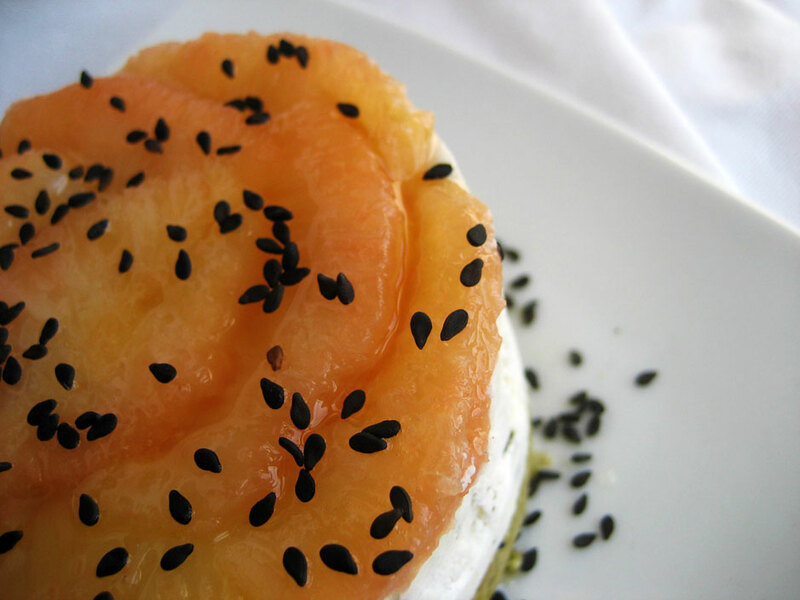 The black sesame seeds are striking against the grapefruit! Beautiful presentation! I didn’t use pectin either to make my marmalade–used a different recipe and it was bitter in a lovely way. Great twist on the recipe. After all the debate and planning (kinda) the date snuck up on me and I’m still a DB slacker. Oops! your tian is right up my street! yum! A matcha tian with black sesame seeds – WOW. This sounds really interesting! Good job! Wow, great job! Definitely outside the box, but that’s good! I just love the colors of your tian! The sesame seeds make it look ready for Halloween on top! Great job! Just stunning, great flavor combination’s. Wonderful job, cheers! It has been a while since I’ve seen a matcha creation from you, and I love the idea of it in the tian with grapefruit and sesame. Nicely done. Great job! I love your flavor combination – I bet it was great!! I love this – it looks sensational. 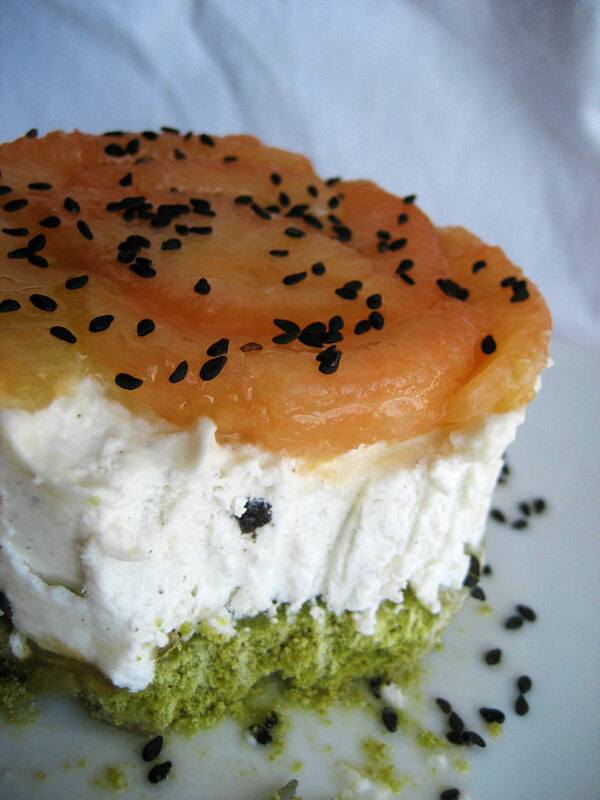 I like how you cut the sweetness with the sesame and grapefruit. wow matcha sablees!! beautiful looking tian! Love your version. So creative. I just bought some matcha powder, will be putting it to good use soon. Liked the colours and flavours in you Tian. Looks so pretty, Anna. Wow!! So beautiful and creative. I love the flavor combination and the colors. I love the matcha sablee AND the black sesame seeds. Very pretty. Very cool! Love the interesting flavor ideas you used. I should have tried grapefruit, I have 3 of them slowly decomposing in my fridge! I’m so glad I did this challenge, I found the orange caramel interesting, and the flavors together were really nice and zingy. I think you have a very interesting twist of tian’s flavor – matcha with black sesame paste. Who could have thought of that? 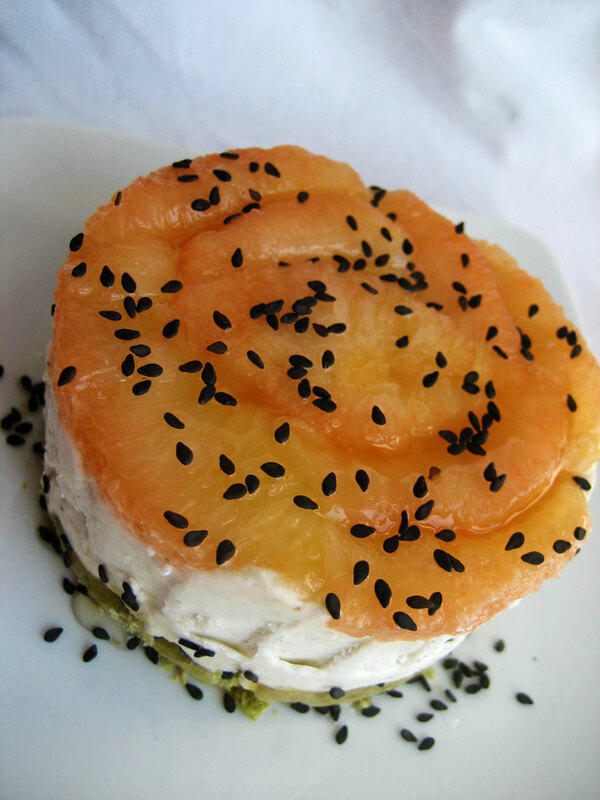 And sprinkling sesame on top of the grapefruit segments just make it so appertizing. Great job! Love the matcha sablees, absolutely beautiful. Your tian looks gorgeous with the black sesame seeds on it too! Wow, I love your creativity on this! 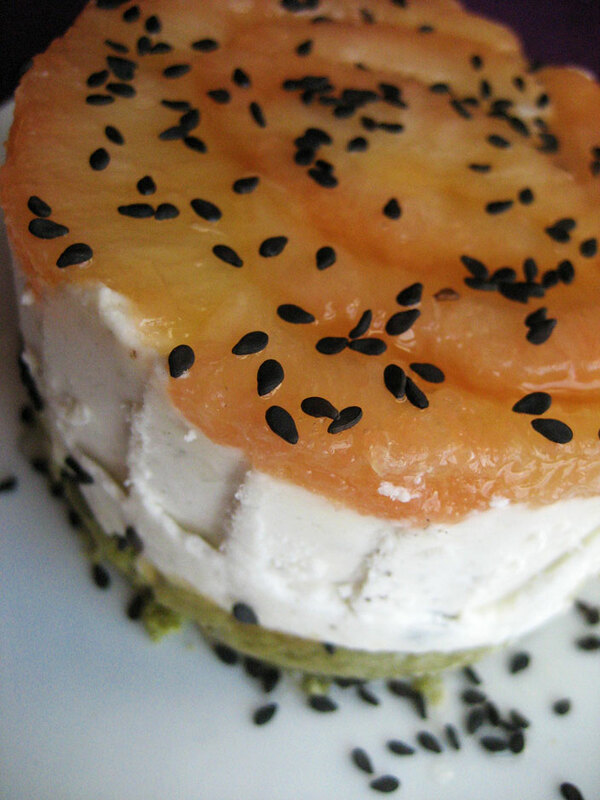 Gorgeous, and I love sesame and grapefruit, but never have eaten them together. This would inspire me to try them!